The comments book of the Old Calcutta Tandoori shows just why it is one of London’s favourite Indian restaurants. Members of Parliament and many celebrities have all visited and enjoyed this famous establishment – but whether you are a Lord or a local you can be assured of the same high standard of food and service to satisfy any palate. Whilst The Old Calcutta has its list of traditional favourites, there is also an impressive array of regional specialities that you will struggle to find elsewhere. Eggon Ronay recommended. Abdul Mazid, owner of the Old Calcutta since 1992, has garnered a host of awards, not least of which is the Gold Certificate Award from The Gourmet Guide. His restaurant has also been praised by the Evening Standard critic, Fay Maschler. The Old Calcutta hasn't been without its celebrity guests either, for it has been visited by no less a personage than Bishop Desmond Tutu and many television personalities and Members of Parliament, so it looks as if Mr Mazid and his staff have a hit on their hands. The decor is lavish in the extreme in a pleasant colour scheme of pink, black and gold. There is fine Indian art displayed on the walls and plenty of plants to decorate the room. The moment you sit down you feel immediately at ease. The Old Calcutta has created a loyal customer base, with some of over 30 years standing, but new customers are being particularly tempted by the restaurant's value for money buffets and set menus. On Monday to Thursday there are special curry nights and a buffet every Sunday noon-midnight. Open every day noon-2.30pm and 6pm-midnight. All major credit cards accepted. No service charge. A taste of the exotic. 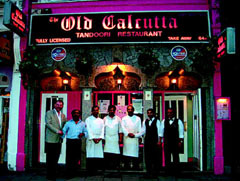 The Old Calcutta's hallmark is distinctive, fresh and exciting ingredients cooked to the taste of each individual customer - it is little wonder that people keep coming back to this award-winning restaurant.